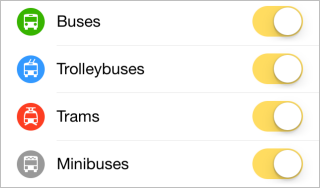 Select your city from the list on the page that appears (next to the city name you will see icons for the types of transport available in the app). The selected city will display in the Current city line. You can set routes within the selected city and see traffic conditions. Satellite — satellite image of the territory. Hybrid — combination of map and satellite modes. Enable or disable the Map → Zoom buttons option. Enable or disable the Map → Map rotation option. Enable Show on map and select the types of events that you want to display. See Road alerts and conversations. Enable Show on map and select companies. Routes will be created using the selected types of transport. Enable this option if you want to use the reminder. See the version of the app on your device. Get a link to the license agreement for the app. See the list of data suppliers that provide information about public transport (the list of the cities is given in Select your city). Here you can also send questions and suggestions to the developers. Choose apps under Other Yandex apps. If the app is already installed on your device, it will launch. If you haven't installed it yet, then the download page opens.